Welcome back to another exciting Toybox Thursday! The GeoSafari Dino Dig Velociraptors Set. 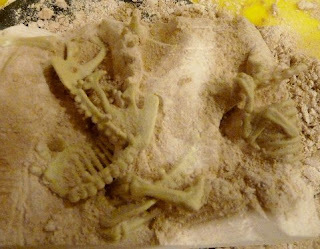 This awesome paleontolgy inspired kit provides children with a realistic archaeological dinosaur digging experience on a manageable at home/school scale. 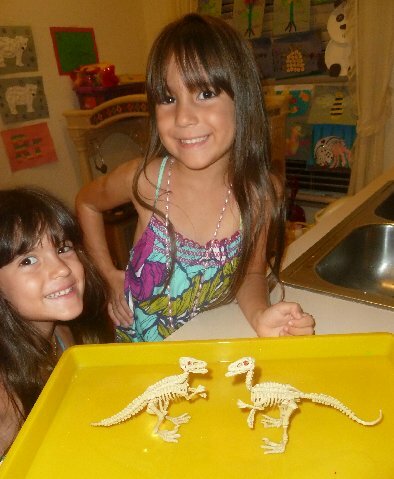 The Lil Divas (and I) were excited to dig in and uncover our dinosaur bones. 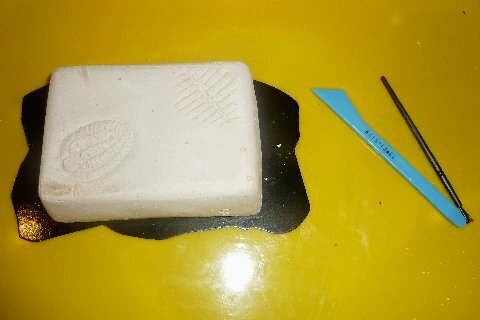 The purpose of this kit is to give an archaeological experience so you have to use the tools to excavate the bones. 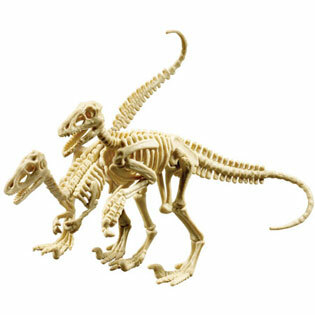 Once all the pieces have been uncovered you assemble the 2 velociraptor skeltons using the bones and the wax adhesive. 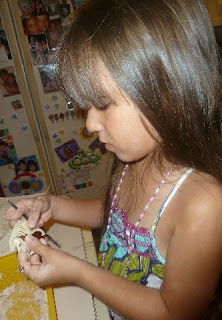 We added a few drops of water to the top of the clay so that it was easy to start to dig for lil hands. I also kept a cup of water nearby so we could dip the excavation tool ever now and then and help the clay get moist if it got too hard for the Lil Divas to manage. 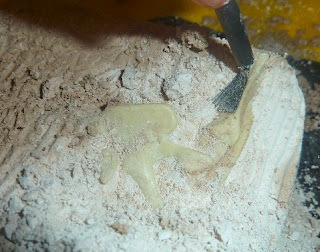 They did great and pretty soon we had uncovered our first bone. They were so excited! I showed them how to brush off the excess clay and to dig around the bone, being careful not to break the bone we were trying to excavate. Check out these determined, hard at work faces! 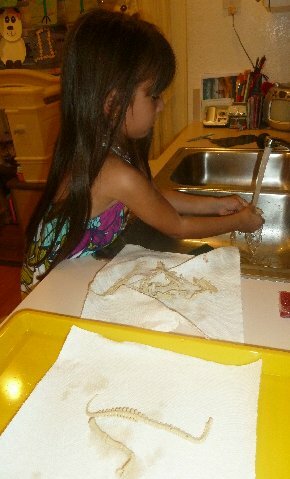 The project did take team work because it took us quite a while to get all the bones free. This would be a great small group project at home or in the classroom. With a few people taking turns - no one got too tired of digging and everything stayed exciting and anticipatory as we watched new bones being uncovered. 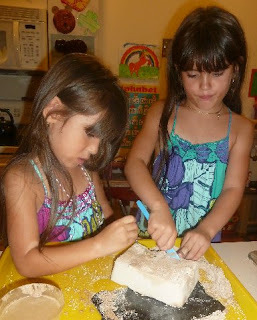 The Lil Divas loved getting a hands-on look at each of the dinosaur bones as they came out of the clay. One bit of advice/caution - make sure you have a good work space. With little hands involved - things got quite messy with clay debris flying all around even though we were working on a tray. It was easy enough to clean up but in their zeal to dig & brush the clay away from the bones - things got messy! 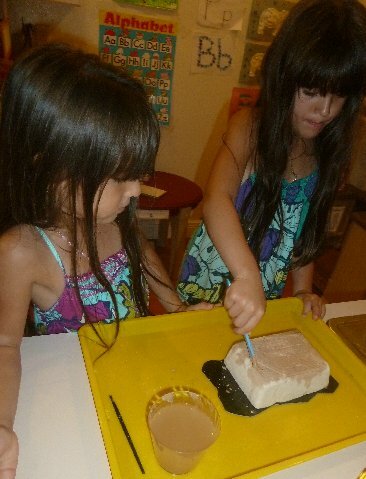 Of course where kids are concerned Messy = FUN! 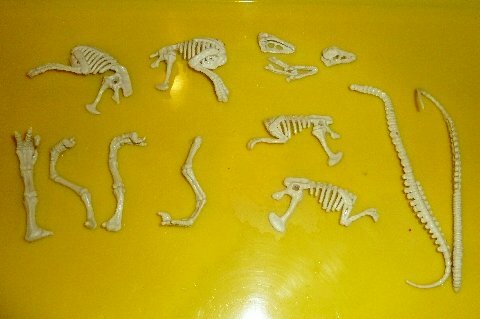 Once all 14 pieces had been found, we washed them and laid them out to begin assembling the skeletons. The assembly was the trickiest part of doing this with little ones. It works like a puzzle. You try the pieces out until you find what fits/works. I did quite a bit of helping with this part of the activity because in order for the pieces to stay together you must use the wax adhezive and they had trouble with that. They either took out a large piece or too little wax so I was mostly in charge of adding the wax and they would connect the pieces together. We were all so excited when our 2 velociraptor skeletons were complete! It felt like such an accomplishment after our time and effort! 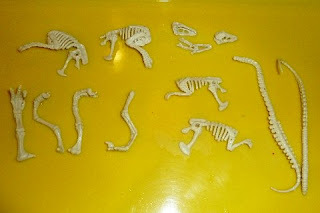 These kits are a fabulous addition to any Dinosaur unit study﻿ - I really think it would be great for a small group project. This would also definitely be a hit for any dinosaur enthusiast. I really enjoyed working with the Lil Divas on this project so I am excited that we get share the fun with our readers because Educational Insights if offering 1 GeoSafari Dino Dig kit to one lucky Mom to 2 Posh Lil Divas follower! 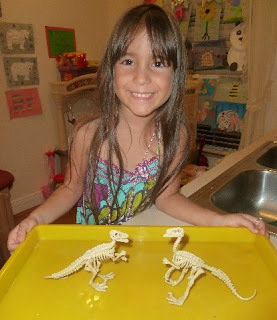 tell me which GeoSafari Dino Dig kit you would like to win. Please include your email with your comment so that I can find you if you're our winner! 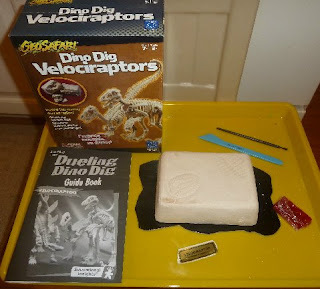 Disclaimer: I received The GeoSafari Dino Dig Velociraptor Kit for free for the purposes of trying it out for this review. That being said, this review is my 100% honest opinion of this product - I am not paid for my reviews or optinions! They are 100% mine! Please remember that your opinions and tastes might differ from mine. My son would love the Velociraptors kit! Left a comment on your 'D is for Dinosaurs' post. Way too cute!! Can't wait to try it! Left a comment on your 'D is for Dinosaurs' post. My son is obsessed with dinosaurs right mow. I think he would love the t-rex dig. I like the triceratops, if I have to choose. I'm afraid of dinosaurs. Lol. Seriously. I'd pick the T-Rex one. My son would love this! I would love to get the GeoSafari Dino Digs Tyrannosaurus Rex!! My grandson would really enjoy the "GeoSafari® Dino Digs Triceratops" if won thanks! Would love the GeoSafari Dino Dig Velociraptor kit! I'd like to win the T-rex kit! I would love to win triceratops for my kids! What a unique toy!!!! My nephew would love the triceratops dig kit. My kids would like GeoSafari® Dino Digs Tyrannosaurus rex. I love the triceratops kit! My older son got an Egyptian fossil kit for Christmas and loved it! Both my boys are crazy for dinosaurs so this is something they would love!! !